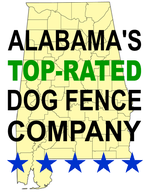 Why is Pet Stop of Alabama your best pet fencing & management choice? First of all, we guarantee containment – with no time limitations. It’s our only job, after all. Simply put, we do what we say we’ll do. We will make sure your pet has the best containment situation possible, giving you the peace of mind you need where your loved pet’s safety is concerned. We use the best equipment on the market, coupled with our easy and humane training methods to achieve this goal. You can’t argue with success; we’ve effectively contained over 11,000 dogs and cats since we started in 1994 – and have yet to find the pet we can’t contain. Our services don’t stop with pet containment, either. We offer a complete line of electronic dog training collars & electronic bark control devices, as well as a large selection of pet doors & full installation services. Customer referrals account for 70% of our new customers. People just don’t refer their friends and neighbors to someone they don’t trust. But don't take our word for it; do what many of our customers have done. Go to your favorite Facebook community group (eg. "What's Happening In...") and post a question like, "Which company should I hire to install a pet fence system?". Check our reputation online with Angie's List, Home Advisor, Facebook, Google or any other rating service. We've provided convenient button links to the left. Doing the best job we can means we expect to be proud of our well-earned reputation, both online and in your neighborhood. What makes our equipment better? 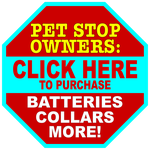 Designed and manufactured right here in the U.S.A., Pet Stop® brand electronics boast the lowest failure rate and highest success rate in the industry. The Pet Stop® engineering team are the acknowledged leaders in the industry, responsible for every major innovation since the industry’s inception. Patented DM signal technology virtually eliminates signal interference, a problem that still plagues other systems. Firmware based and totally programmable, Pet Stop® pet fence equipment can be made to emulate all other major brands, so you can upgrade inferior products piece by piece if desired. With the addition of the EcoLite+™ Rechargeable SmartReceiver collar, Pet Stop has extended their already enormous lead in the pet containment technology race. No other company in the industry’s history has made such ground-breaking strides in pet fence technology. esigned and manufactured right here in the U.S.A., Pet Stop® brand electronics boast the lowest failure rate and highest success rate in the industry. The Pet Stop® engineering team are the acknowledged leaders in the industry, responsible for every major innovation since the industry’s inception. Patented DM signal technology virtually eliminates signal interference, a problem that still plagues other systems. Firmware based and totally programmable, Pet Stop® pet fence equipment can be made to emulate all other major brands, so you can upgrade inferior products piece by piece if desired. With the addition of the new EcoMini™ Rechargeable receiver collar, Pet Stop has extended their already enormous lead in the pet containment technology race. No other company in the industry’s history has made such ground-breaking strides in pet fence technology. How are our training methods better? Our background in dog behavior training and long experience in the pet containment industry have allowed us to evaluate every pet fence training method used in the business. We have tailored our processes to be humane and non-traumatic for even timid pets, working with leading experts in animal behavior to tweak it even recently. While we ask our customers not to train outside our parameters, we do allow ourselves the flexibility to tailor the training process to accommodate each pet individually. 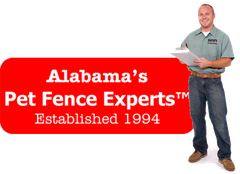 With either our free Training Assistance or Pet Fence 101, our Certified Complete Training option, we can be confident in successful results. Our customers’ pets experience less fear during training, yet our success rate continues to outperform all competitors. What makes our customer service better? We care about our customers’ opinions of us, and we act accordingly. In our industry, we find that simply showing up for service is enough to be better than most; but we try to put ourselves in our customer’s shoes. Our company services every brand of pet fence system, with hundreds of customers whose systems were originally installed by other companies. We’ve seen more than 30 competitors go out of business since 1994, but we’ve always remained. We are committed to providing the best service available in the industry, and we do it every day. 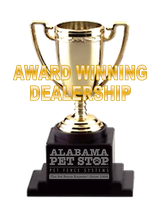 No dealer in the entire industry has more experience with every brand than Pet Stop of Alabama.